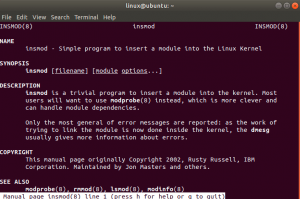 insmod is a simple and fast program to insert the modules inside the Linux kernel. insmod is very close to program modprobe, insmod does not read its modules from a set location and automatically insert them and take care of any dependencies. What’s the difference between insmod and modprobe? insmod on the other hand accepts pathway to files. The module does not have to settle in /lib/modules/$(uname -r), but dependencies are not automatically uploaded. This is the lower program used by modprobe to load modules. When you use insmod to insert the module, I may get there error “Invalid module format”.